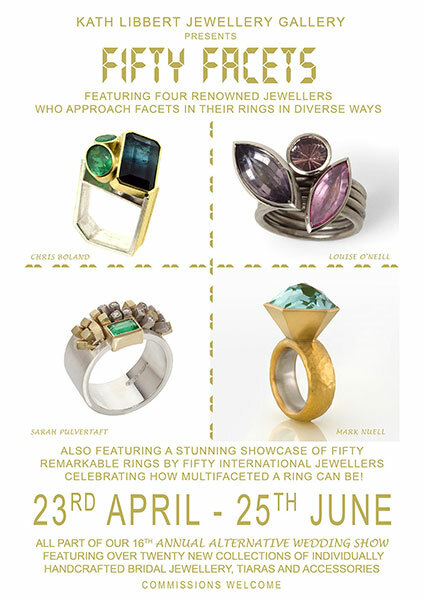 FIFTY FACETS - Celebrating just how multifaceted a ring can be! 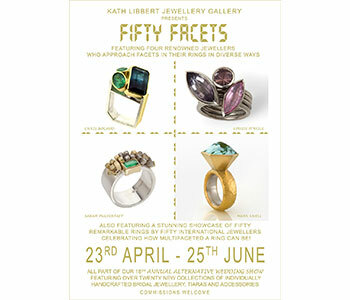 Fifty Facets is a selling exhibition which focuses on the array of ways in which rings can be faceted. The exhibition will feature four renowned jewellers who approach facets in their rings in diverse ways – Chris Boland, Sarah Pulvertaft, Louise O’Neill, and Mark Nuell. Alongside their collections will be Fifty remarkable rings by Fifty international jewellers celebrating just how multifaceted a ring can be – from a ring crafted from sugar crystals, to a faceted ebony Matterhorn ring, to a ring carved in the shape of an angular agile golden Panther! There will also be a participatory aspect to Fifty Facets to help engage visitors more with the work on show. A Fifty Pound Prize will be given to the creator of the Facetted Ring that gets the most public votes in My Fave Facet is.....and all voters will be entered into a Prize Draw to win a Fifty Pound KLJG Voucher! We are delighted to announce that the talented jeweller Chris Boland from Sheffield will be giving a talk about his distinctive jewellery at the launch of Fifty Facets at 3pm on Sunday 23rd April. His unique approach to working with gemstones and great knowledge of them will be fascinating / facetinating!! All are very welcome! Bubbly and canapés will be served from 2pm – 5pm. Sarah Pulvertaft; Louise O’Neill; and Mark Nuell. Alongside their collections will be Fifty Facets: 50 remarkable rings by 50 international jewellers, celebrating just how multifaceted a ring can be. All part of our 16th Annual Alternative Wedding Show featuring over twenty new collections of individually handcrafted bridal jewellery, tiaras and accessories. For examples of our Precious Collections please see here.